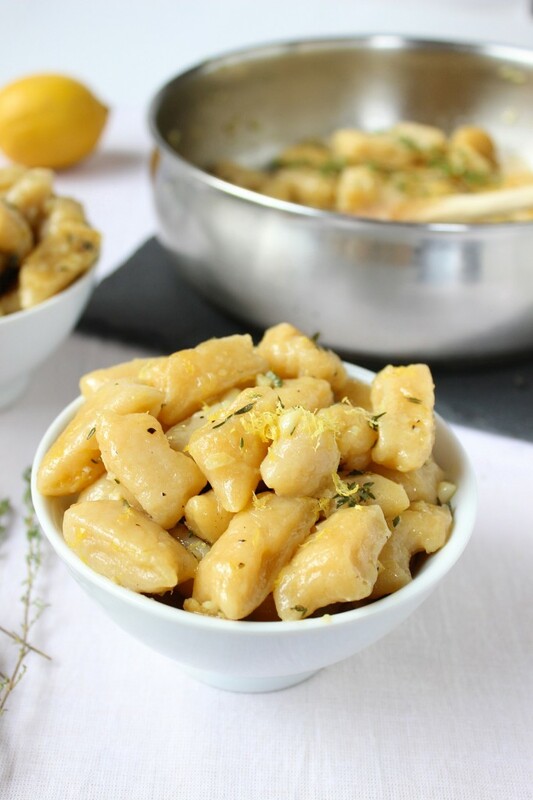 Rutabaga gnocchi is a new twist on rutabaga dishes to make at home. 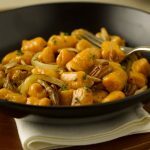 Their sweet, fresh and crisp flavour is great raw, and will make your house smell wonderful as you knead it into this gnocchi to simmer on the stove. Lemon and thyme make this dish bright and colourful to complement the sweetness of rutabaga in this savoury dish! Use a sharp knife to slice off the peel of the rutabaga. Chop the rutabaga into 1-inch (2.5 cm) cubes. Put in a medium saucepan, cover with water and bring to a boil. Boil for about 25 - 30 minutes until rutabaga is very soft and falls apart when pierced with a fork. Drain, then return rutabaga to the pot. Use and immersion blender or potato masher to blend until completely smooth and lump free. Put in the fridge to cool completely. Once cool, add 2 cups (475 mL:) of the puréed rutabaga to a mixing bowl, 2 cups (475 mL) of the flour, and the salt. Mix and add in more flour as needed until the dough stops sticking to the sides of the bowl. Flour a clean work surface, remove the dough from the bowl and lightly kneed until dough comes together. Add more flour as needed so that dough is soft but not sticky. Divide the dough into 6 and roll each section into a rope. Use a knife or pastry cutter to slice the ropes into gnocchi. Set gnocchi aside on lightly floured baking tray until you are ready to use. Bring a large pot of water to a rolling boil. Drop gnocchi into the pot one at a time, cooking in batches of about 20 so that they don’t stick together. Cook for 4 minutes until gnocchi is floating. Use a slotted spoon to scoop out the cooked gnocchi and set aside in a bowl. Continue cooking the remaining batches. In the meantime, finely mince the garlic, zest and juice the lemon, and remove thyme leaves from the stems. The easy way to remove thyme leaves, is to hold the top of the stem, and run your fingers down with the other hand, which easily pops off the leaves. Heat olive oil over medium heat, and when hot, add the garlic and thyme leaves. Cook about 1-2 minutes until the garlic just starts to get a bit of colour and then remove from heat. It will continue to cook once removed. Toss in the hot gnocchi, lemon zest, lemon juice, maple syrup, salt and pepper and toss. Serve immediately. Make ahead tip: The gnocchi dough can be prepared and cut ahead of time. Store on a covered, lightly floured baking sheet in the fridge overnight. 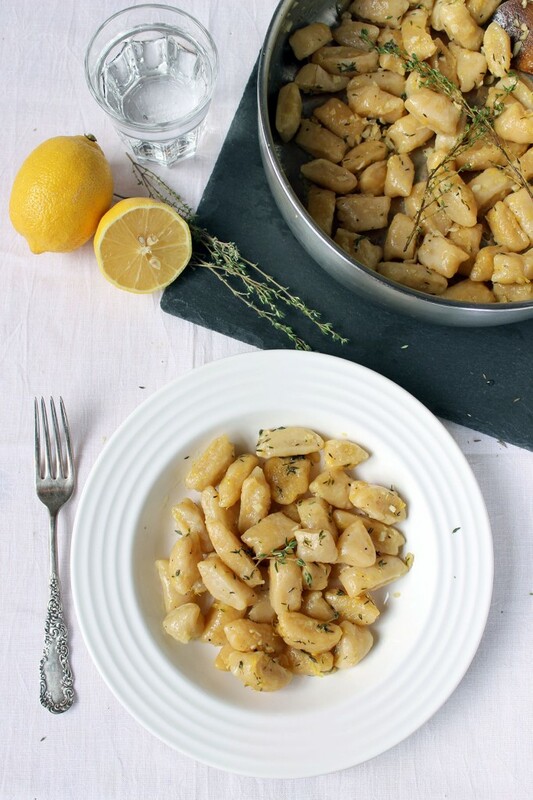 Or you can freeze, by arranging the gnocchi in a single layer on a lightly floured baking sheet. Put the sheet into the freezer so the gnocchi can freeze individually, about 3 hours. Gather the now frozen gnocchi, and store in an air tight container or freezer bag. They should last about 1 month. Pop frozen gnocchi directly into the boiling water, and cook until floating (about 4 - 6 minutes). 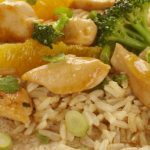 This recipe was developed by Sam from It Doesn’t Taste Like Chicken. Sam is vegan and an artist, but she’s not starving! 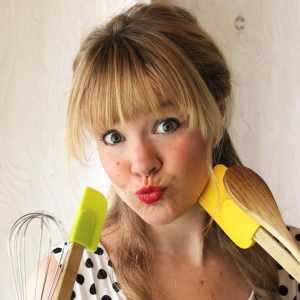 Writing her vegan-focused blog from Toronto, Sam’s goal is to do for vegan cooking what Julia Child did for French cooking. Make it common, on every table, in every house, and every mouth! 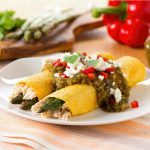 Sam’s recipes are designed to please your mind, body, soul, and taste buds. 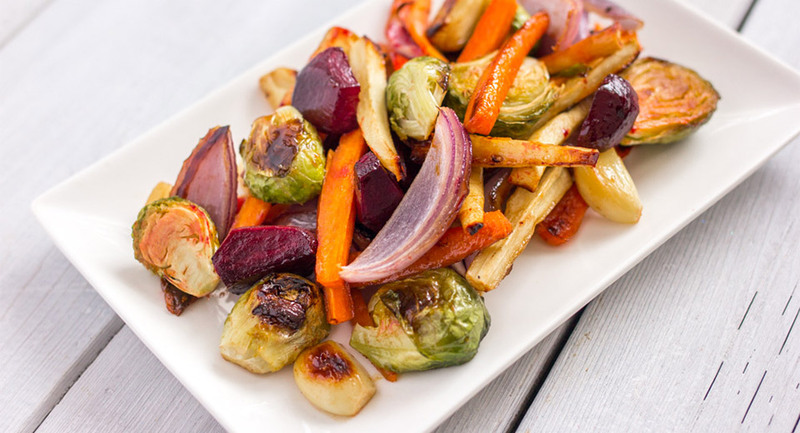 Hi Tima,We love that you're trying rutabaga in your favourite recipes to accommodate your diet! We don't have any specific recommendations for those types of recipes, but we've seen many people see a lot of success with replacing traditional wheat flour recipes with GF blends using almond meal and/or coconut flour. We did a quick search for rutabaga pizza crust, and maybe this will do the trick? Best of luck!